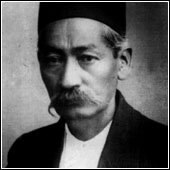 He was born in Tehran in 1872. His teachers were his father and Agha Hussein Gholi Farahani, from the most respected musician family of the ninteen century in Iran. He was a member of the Aziz Soltan music group. Afterwards he went to the Darolfonoun Music School. He recieved the First-class Medal from the Government of France for his works and concerts for poor people. He played an exceptional concert in the Grand Hotel of Tehran with other great masters of Persian music such as Aref Ghazvini, Hadji Khan Zarbgir, Ebrahim Mansouri, and Reza Mahjoubi. He also went to London in a 3-month journey to recorde a disc with Habibollah Shahrdar, Hussein Taher Zadeh, Bagher Khan Rameshgar, Asadollah Khan, and Akbar Flout. He also went to Teflis, in Georgia with Bagher Khan, Hussein Taher Zadeh, Eghbal Azar, and Abdollah Davami for one year. Despite the fact that he was considered as one of the masters of the ninteenth century and the beginning of the twentieth century, he had a really modern ways of performing and composing.Indeed he was very talentous in compositing. He also recorded many disc playing Tar and singing. It's said that he added one string for the Tar. Among his most prominent pupils we can name Hussein Ali Ghafari, Saeid Hormozi, Hussein Sanjari, Shokri, Mohammad Ali Safaei, Abdollah Dadvar, Mousa Maroufi, Morteza Ney Davoud, Abol Hassan Saba, Arsalan Dargahi and Akbar Khan Norouzi.He died in a car accident in Tehran in 1926.